This entry was posted in brochures and tagged kids on February 18, 2015 by James Day. A MOTORER’S GUIDE TO WAITING. An activity book for the kid in you. 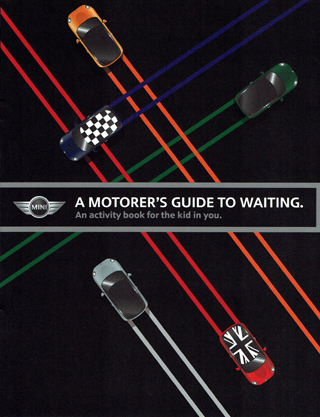 This 8-page booklet measures 8.5″ x 11″ and contains various activities for kids, presumably to keep them occupied while waiting at a MINI dealership. 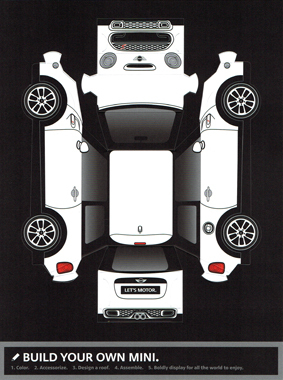 Design Your Own MINI and Roof Graphic. Color Your Own Road Trip. There is a separate BUILD YOUR OWN MINI. insert which allows one to design, punch out, and fold up a MINI Cooper S Hardtop.